Core box air release vents enable "core blowing" equipment to effectively fill the core box with sand, and allow for the safe escape of gases, heat, and air during core manufacturing. 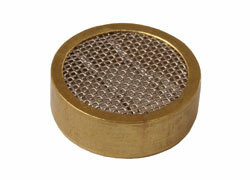 Freeman offers a large selection of vents in brass, brass alloy, steel, and aluminum for a wide range of applications. Three basic metals are offered: Brass, Steel, and Aluminum. Brass is a softer metal which makes it easier to contour, remove from the core box, and clean. 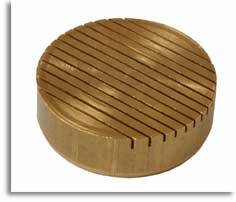 Brass Alloy (SAE-430-B), available only with Ventistamp core vents, features higher wear resistance than steel. Steel vents offer greater wear resistance, can withstand higher temperatures, and match metal with steel core boxes for uniform heating and cooling. Aluminum vents are popular for Styrofoam molding applications and offer many of the same advantages as the steel vents. Nearly all of the core vents sold are one of the four styles: Shalco Super Vents, Ventistamp Zanatta vents, Slotted vents, and Screen vents. The width of the slot or the size of the mesh required is determined by the size of the sand (mesh) being used in the construction of your core. The width/mesh of your vent must not be greater then the sand mesh in order to hold the sand in the core box while permitting the air to escape. Depth – is based on the depth of the shoulder created by the step drill (insert drill). Head Thickness – affects the ability to contour the vent to the tool surface. The thicker the head the more contouring can be done and the thinner the head the less likely it is to clog with binders. Diameter – is determined by the size of the area requiring venting and the number of vents preferred in the particular location on the core box.